Whether you want to make sure your windows can stand up to high winds, or you want to fortify your home against potential burglaries, investing in safety glass is a common decision for many homeowners. Two of the most popular forms of safety glass are laminated and tempered glass, and both have their fair share of pros and cons. So, how can you know which is best for your home? As experts in the window and glass industry, we’ve prepared this guide to the ins and outs of both laminated and tempered safety glass. These criteria are why safety glass is always used for shower doors, car windshields, and many other glass products. 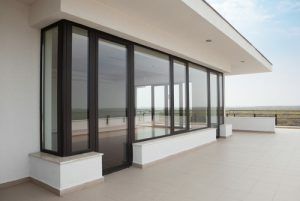 Both laminated and tempered glass are considered safety glass because they meet the requirements set forth by various code organizations that enable them to be used in the situations above. Laminated glass is composed of two or more glass panels that are joined together by a layer of either plastic or polyvinyl butyal (PVB). This essentially forms a glass sandwich, with the glass nestled between the two outside layers. Laminated glass can block up to 97% of UV radiation, making it ideal for rooms in your home that get a lot of sun, in order to protect your furniture from UV-related fading. This also makes laminated glass exceptionally energy efficient, as it can block unwanted heat from entering your home while also acting as an insulator to keep air in your home. Both laminated and tempered glass are safer than regular glass when it comes to how the glass breaks. When laminated glass breaks, the broken glass sticks to the plastic or polyvinyl butyal (PVB) layer that binds the glass, rather than falling to the floor. Tempered glass shatters into rounded cubes instead of jagged shards, reducing the potential for injury and making cleanup a much easier process. Laminated glass has the added security benefit of superior soundproofing. This helps to keep your home quiet and keeps any potential intruders from hearing what goes on inside. If you live near an airport, major intersection, or other loud environments, laminated glass can keep the noise from the outdoors out of your home as well. Generally, laminated glass carries a slightly higher price point than tempered glass, due to its complicated manufacturing process. Laminated glass is typically only available on request, as it’s not cost effective for glass companies to manufacture it unless there is demand for it. Because of this, laminated glass is used less often in residential construction than tempered glass. Tempered glass, on the other hand, is widely available and cheaper to produce, resulting in a lower cost for homeowners. Both tempered and laminated glass are more expensive than normal glass, due to their specialized nature. Because of this, safety glass is often used sparingly throughout a home, instead of being used for every window, door, and glass fixture in the house. Strategically using safety glass in places could benefit from it, such as the windows in the front of your home that would be more likely to be broken by an intruder, can lower costs overall. One of the biggest disadvantages of laminated glass is the installation process. The glass is heavy, and can only be installed by trained professionals in a process that can take a number of days. Any replacements or changes to the glass can only be done by a professional. Additionally, laminated glass is very difficult to cut, limiting flexibility in terms of design. Tempered glass also requires a professional installation, but the process is not as lengthy. In terms of maintenance, the strength of laminated glass means that it requires little to no upkeep in order to maintain its stability. If minor damage does occur, minor repairs are possible. When done correctly, there will be no loss of clarity or strength. Unlike laminated glass, tempered glass cannot be repaired. When damage occurs, the only course of action is to replace the glass altogether, which can be costly. However, due to the durability of tempered glass, it’s unlikely that you will have to deal with very much damage. No matter if you need an emergency repair, or you’re looking for all new windows and doors for your home, you’ll be blown away by our dedication to going the extra mile for our customers. Contact us today to speak with one of our friendly team members and get a free quote. Previous PostWhich Is Better: Framed or Frameless Shower Doors?